What Was The Biggest Backfiring Of A Plan In History? Geez, this Hitler guy is really popular and scary. I don't want him in power. Scottish border reivers invaded England in 1349, during the height of the Black Death. They believed it to be Gods punishment upon the English, and saw an opportunity to strike while the English population dwindled. All that happened was the plague decimated their ranks, and as the English pursued them northwards, they spread plague throughout Scotland. The Chinese four pests campaign. During Medieval times the general population came to fear cats as consorts of Satan. As innocent cats were killed by the thousands the rat population soared as did deaths from the plague. Back when the British had ‘claimed’ India the new rulers got a bit worried about the number of snakes. The government soon set up a plan – a small reward handed to anyone bringing in a dead snake. It worked briefly as locals found and caught nearby snakes. Of course soon some enterprising souls realised catching snakes was a lot of work, so instead started breading them for easy money. 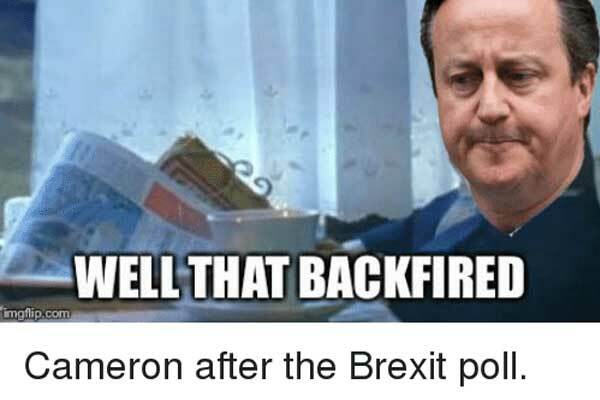 David Cameron promised to hold a referendum on the UK’s membership of the European Union under the assumption that he wouldn’t have to actually do it, in the hope that it would end the divisions within the Conservative Party. I feel ANY time in history where people brought in an invasive species of animals to combat another not only did it ever work but now that place has an infestation with this new invasive species making the problems 100 times worse. After WW 1 making up the middle east and Africa’s countries boundaries. Hindenburg died about a year and a half later. A governor in the khwarezmiad empire who decided to line his pockets by accusing some merchants of being spies, killing them and taking their stuff. Those were Genghis Khan’s merchants. And he was not happy. They poured molten silver down the throat of the governor, and deviated an entire river to erase the emperor’s hometown off the map. Genghis operated on a code of hospitality, and killing envoys was a big no-no. Furthermore, it was the ease with each the mongol armies crushed the wealthy and powerful empire that convinced them to go west and conquer more, leading to their incursions all the way to Poland. They might have just settled on attacking the Song dynasty as they were doing thus far, but alas.